Triphala means ‘three fruits’ - Amalaki, Bibhitaki and Haritaki. When combined as Triphala they form a very powerful Rasayana. A Rasayana is a herbal combination that enlivens the inner intelligence of mind and body from a fundamental level promoting rejuvenation and long life. Triphala is particularly rejuvenating for the digestive tract, and is a Rasayana for the eyes and the skin. When combined with Rose petals (Rosa centifolia) many of these benefits are enhanced. It is a mild laxative and is excellent for clearing toxins from the digestive system. 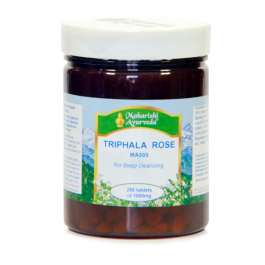 Triphala Rose has a gentle cleansing action on all the body’s tissues including blood, muscle, urinary tract and fat tissue. When it is taken for a long time this cleansing action becomes gradually deeper and more thorough. Triphala enhances the main digestive fires in the stomach. These are known as the 13 agnis which also include seven dhatuagnis. The dhatuagnis form the basis of the sequential transformation of tissues from one type to the next. It is in the gaps between the tissues that the intelligence of nature operates, if there is any dullness in these gaps Triphala helps to remove it. The great Sage Charaka considered Haritaki to be as nourishing as mother’s milk. Haritaki is a rasayana for the eyes and skin and is said to maintain the balance of all aspects of the skin. Sushruta Samhita, a classical Ayurvedic text on surgery, states that Haritaki and Triphala are useful in cleansing wounds and rejuvenating the insides. Charaka also stated that it is good for the digestive system and helps to enhance the absorption of nutrients in food. It cleanses both the micro and macro circulatory channels. The Amla fruit is so prized in India that is said to be divine. The Charaka Samhita says “Amalaki is the best among rejuvenating herbs”. 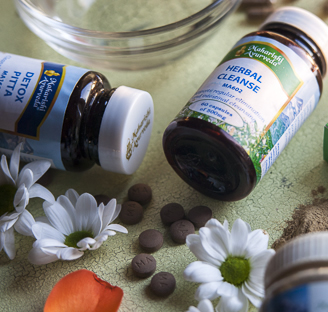 Amalaki helps cleanse the body in many ways. By enhancing digestion and food absorption, food is converted into useful substances rather than becoming undigested and toxic. A rare quality of Amalaki is that it heightens digestion without being heating, and is traditionally considered one of the best herbs for balancing stomach acidity. It helps support the liver, one of the main organs on which we rely to deal with the side effects of our dietary and lifestyle errors and exposure to pollutants. It is also assists with bowel movements and is supportive to the urinary system by helping the body eliminate excess water in a natural way. Sushruta Samhita says that Bibhitaki helps to purify the blood, maintain blood clotting ability, and purify and keep channels in the body clear. Charaka also states that Bibhitaki is ideal for pacifying Pitta and Kapha; it cleanses the Rasa, Rakta, Mamsa and Meda dhatus; is excellent for balancing and nurturing the vocal cords; is antibacterial and is a rasayana for the eyes. The Bhavprakash Nigantu mentions that Bibhitaki is nourishing for the eyes. It is also known to nourish the hair, and helps to maintain the hair roots, colour and thickness. The petals of the Cabbage or Provence Rose (both shatapari and centifolia mean ‘having one hundred petals’) and are renowned for their many health giving properties. They are used in many Ayurveda preparations. Rose petals balance Sadhaka Pitta, the subdosha that governs the heart and emotions. What is less obvious is that rose petals also balance the mind by enhancing the coordination between Sadhaka Pitta and Prana Vata (the subdosha of Vata that governs the brain, head, chest, respiration, sensory perception and the mind). Like Amalaki, rose petals are cooling, yet they enhance agni, the digestive fire. This is the rare quality that gives balance to all three doshas. 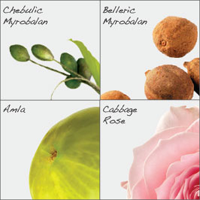 They specifically help to maintain the health of the skin, eyes and menstrual flow. 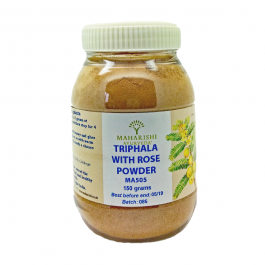 The full benefits of Triphala Rose and its ingredients can only be experienced if the selection and preparation of the ingredients carefully follows the instructions of the Ayurvedic sages. 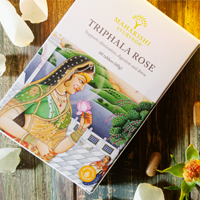 Maharishi AyurVeda is committed to using only the highest quality ingredients and upholding the authenticity of the Ayurvedic tradition whatever the cost. 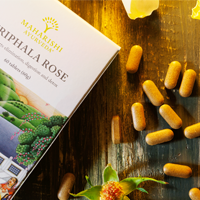 Maharishi AyurVeda Triphala Rose uses only the rarest and most costly of the seven varieties of Haritaki. Tired and sluggish when you wake? Prone to colds, flu and constipation? Ayurveda would say you have a toxic build-up called ama, due to incomplete digestion. Triphala consists of three fruits, which work synergistically to detoxify your entire digestive tract. Cabbage Rose is added to support and enhance the other ingredients. Besides helping you detox, Triphala Rose helps in absorbing nutrients effectively and in restoring your health, immunity and energy. 60 tablets in a blisterpack, 1000mg each, approximately 60-30 days supply. To support bowel activity take 1-3 tablets at bedtime with warm water for up to 15 weeks and then stop for 4 weeks before restarting if necessary. For general health take 1 tablet twice daily, with warm milk or warm water for up to 1 year. Alternatively the tablets may be crushed and taken with honey and ghee (clarified butter) (2-3 parts honey to 1 part ghee). If taken for up to one year, ideally take a gap of at least one month before starting again. The gaps in use give the body a chance to become independent of the supplement.